Alan Robert Signing at Forbidden Planet, NYC July 22nd @ 6PM! Come and meet artist, writer, and musician Alan Robert! 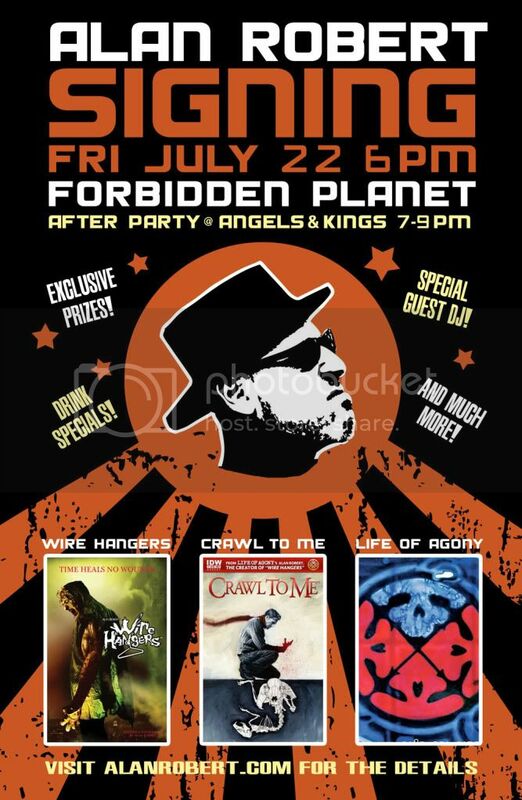 Life of Agony bassist/Wire Hangers creator, Alan Robert, will be kicking off the release of his new comic book series, Crawl to Me (IDW Publishing) with a special signing at FORBIDDEN PLANET (840 Broadway, New York, NY 10003) on Friday, July 22nd, 2011 at 6PM. Exclusive prizes will be given away in a random drawing! After the signing, come celebrate the launch at ANGELS & KINGS from 7-9PM (500 East 11th St., New York, NY 10009). A special guest DJ will be announced, spinning the best heavy music and don’t miss the Crawl to Me Cocktails!